Hey Kids! Who Wants to Be the Next Bruce Ratner? What do you get the next generation’s up-and-coming Bruce Ratners? How about Monopoly: City Edition. Just released, the game scraps houses and hotels for industrial parks, skyscrapers, stadiums, power plants, and other urban icons. Monopoly is one of the most widely-played game on earth: 480 million people have played it since it was invented in 1935. 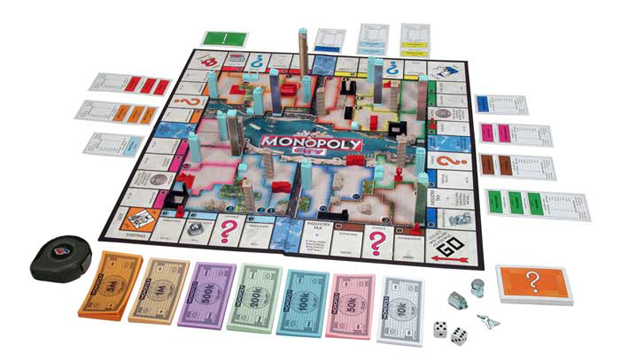 There are Monopoly editions for almost every country–and city editions for their capitals–from China to Caracas. (Cuba had an edition too, until Fidel Castro supposedly ordered all Monopoly games destroyed.) 2008’s World Edition had squares for 20 international cities picked in a global vote by Monopoly players. My favorite, though, will always be Star Wars Monopoly. Dot-Com Monopoly (“I’ll trade you AskJeeves for AltaVista”) from 2000 is runner-up. The worst? Michael Graves and Target’s 2006 special edition: it came in a wacky, plastic capsule; the center of the board was a dizzying reflective hologram; and best of all Boardwalk was misspelled “Broadwalk.” But hey, at least it’s trash-heap-free.